I’ve written a few times already about using daylilies but I thought it would be helpful to have one post to tie it all together. Daylilies have been described as ‘the perfect perennial’, due to their brilliant colours and all round ease of growing. They tolerate both drought and frost and thrive in many different climate zones and soil conditions. They are vigorous perennials that last for many years in a garden and see off most weeds. As if all that wasn’t enough, they are really nice to eat too. Daylily is not one species but a whole bag of them, all in the genus Hemerocallis. Plants for a Future list over 20 species and only one, H. forrestii, gets anything less than a four-star rating for edibility. 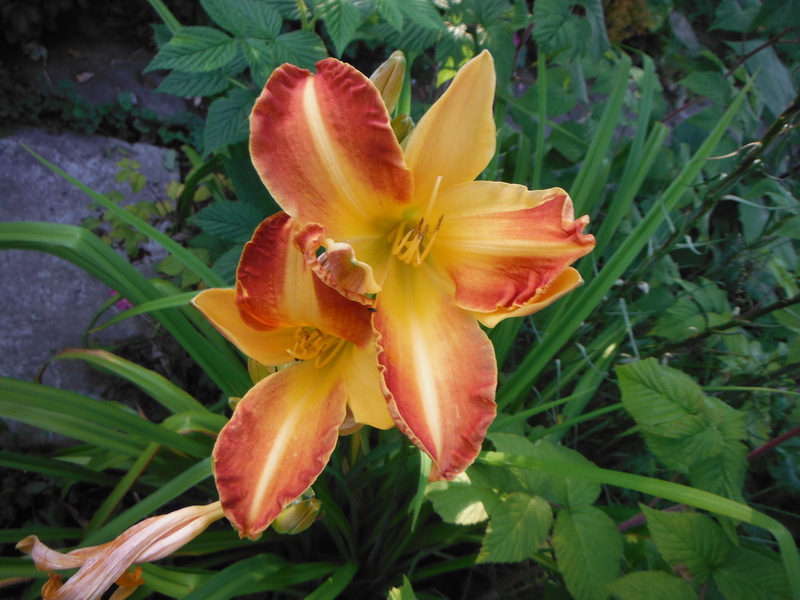 Many daylilies that you might encounter do not fit strictly into any one species as they have been hybridised widely and many are listed only as Hemerocallis and their cultivar name. I should add a few words of caution before I go any further. Daylilies are listed by some sources as poisonous to either humans or pets. Largely this seems to come from confusion with other plants with ‘lily’ in their common name, some of which are not a good idea to eat at all. Many of these plants also look superficially similar to the daylily so obviously you need to be certain that what you are eating is what you think it is (always a good idea in any case). There is a good article by Delishably on the some of the confusion that has arisen here. All I can say personally is that I have experienced no ill effects from eating moderate amounts of the cooked flowers of Hemerocallis altissima, citrina, dumortieri, exaltata, fulva, lilioasphodelus, middendorfii and minor and a range of hybrids. Bear in mind that any individual can have an adverse reaction to even common food plants and any new food should be taken with some care. 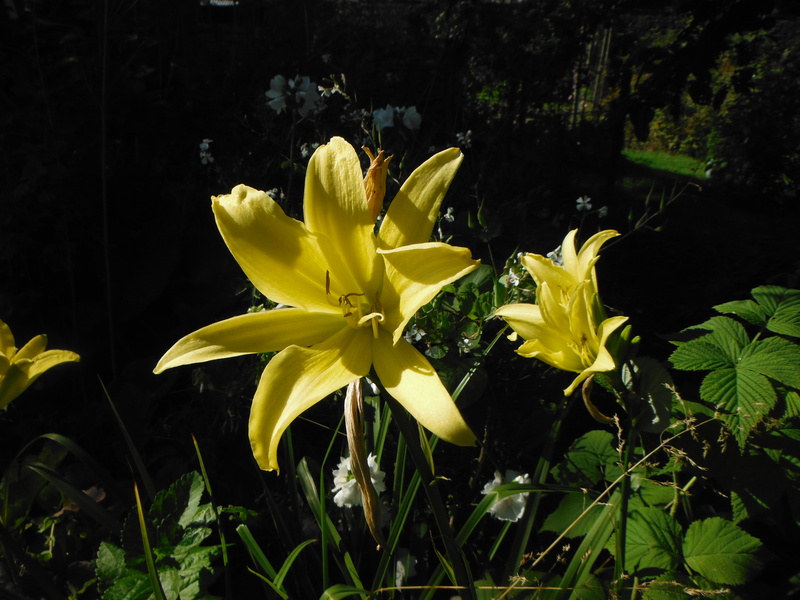 Each new species and hybrid is best treated as new rather than assuming that if you are fine with one Hemerocallis you are fine with them all. The only hazard for the genus listed on Plants for a Future is from a single source and states that large quantities of the leaves are said to be hallucinogenic, so you might want to avoid that (or you might want to try it – I don’t want to make any assumptions about my readers). Daylily flowers are often recommended for salads, which is a bit of a mystery to me as I find them rather unpleasant raw but delicious cooked. The cooked flavour is rich, sweet and complex. The key to bringing out the best in them seems to be frying, which imparts a little bit of a caramelised taste. Perhaps the simplest method is to pan-fry them for about 5 minutes in olive oil. They might have been purposefully designed for stir-frying as their elongated shape is perfect for it. I cut up the largest H. fulva flowers for stir fries but all other kinds just go in whole. One useful property of the flowers is that they will thicken a soup or sauce and I sometimes use them like onion, chopped and lightly fried before adding any other ingredients. There’s a recipe for a miso soup using yellow day lilies (H. lilioasphodelus) here. The flowers can be used at all stages of their development. Many people consider them to be at their best for frying as flower buds, just on the point of opening. I also enjoy the opened flowers this way and the open flowers of large-flowered species and cultivars are great for cooking as fritters or tempura. If left on the plant in dry weather the flowers will dry up and will then last indefinitely in storage. 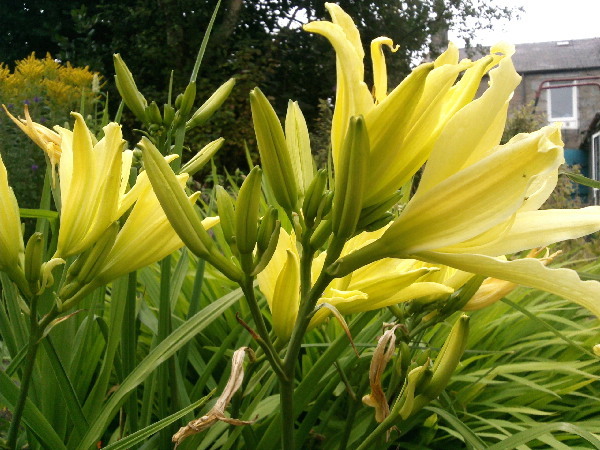 The bags of ‘golden needles’ or ‘lily flowers’ than you can find in Chinese supermarkets are dried daylilies. They seem to keep their ability to thicken a soup even when dried. The young leaves of daylilies are edible (but see the cautions above) and I use them in a mixture with others as a pot herb or in leaf sauce. However, they are no better than many more productive plants and harvesting the leaves presumably leads to fewer flowers so I don’t make heavy use of them. They also quite quickly become tougher and more fibrous. Another part that I don’t use for fear of weakening the plant is the roots, despite one source describing them as ‘quite possibly the best tubers I’ve ever eaten’. I’m sure, however, that if I lived in one of the parts of the world where daylilies really thrive and have become a foragable weed I would be digging them up with enthusiasm. Growing daylilies is easy. They do best in a moist, fertile soil in sun or semi shade. There is apparently a daylily gall midge (Contarinia quinquenotata) which can lead to distorted flowers. Fortunately I have never seen it in my garden. Slugs are fond of the young growth. This isn’t a problem with established plants but new plants are worth protecting when first planted out. Choosing a daylily is harder as they have almost become a victim of their own success. Many new varieties are becoming hard to recognise even as daylilies. The trend in breeding seems to be for ever more open flowers, with petals curved back hard – pretty much the opposite of what you want for cooking. Smaller flowers and delicate, divided petals are two more qualities prized by breeders but not by chefs. On the whole, this means that older, more traditional varieties are better for cooking. Varieties I use include Whichford, Burning Daylight, Franz Hals, Yellow Moonlight, Pink Damask and Cream Drop. You can also find double varieties of daylily which have the culinary advantage of being chunkier: H. fulva ‘Kwanso’ is one that I grow. Two common varieties that I have found rather disappointing in terms of size and yield are ‘Stella de Oro’ and ‘Corky’. In countries where daylilies self-seed I expect there is a tendency to revert to type. If you are lucky enough to live in one of these countries and you find a particularly nice wild specimen I’d encourage you to take it into cultivation and pass it around. It’s a pity that no-one seems to be actively breeding daylilies for their culinary rather than their ornamental properties. I would certainly buy them. This entry was posted in Species and tagged daylily, edible flowers, forest garden, Hemerocallis, Hemerocallis fulva, Hemerocallis lilioasphodelus, perennial vegetables. Bookmark the permalink. How long is the daylily season – when does it start and finish? I particularly like the idea of them thickening soups. I usually have them from May to about September. The trick is to have a range of species and/or varieties which flower at different times. Yellow day lily (H. lilioasphodelus) is usually first. Those that flower early often have a second flush in late summer. Thanks for asking. I should have put that information in the article really. I’ve been looking into day lilies recently. Due to my small garden, I’ve been trying to find small/dwarf varieties that can fit under an apple tree without outcompeting everything else. Are any of the varieties you’re growing on the smaller side? I had never thought of eating daylily blooms. I think I enjoy looking at them too much, but might be worth a shot! 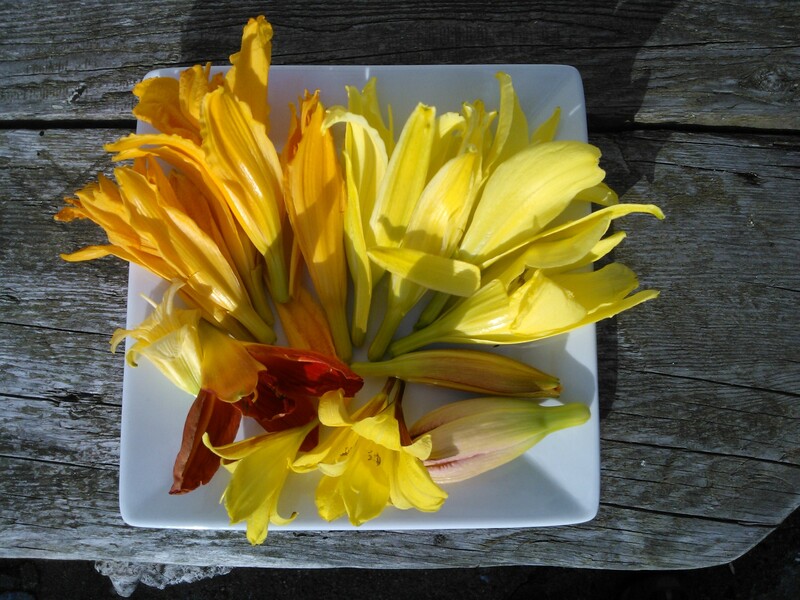 That’s the nice thing about daylilies – you can eat them and there will still be more to look at in a day or two!